Christmas cracker gifts are a great thing to 3D print. You can choose just the right item for each family member. There are lots of small items that are useful and quick to print so you'll be able to find something for everyone in the family from kids to grandparents. 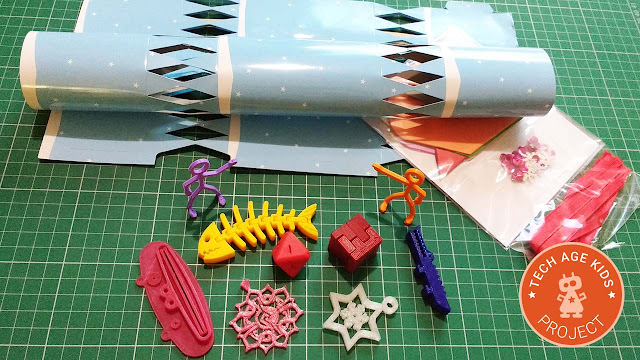 You can make your own Christmas crackers or just buy inexpensive ones that can be opened from the end and pop in an extra gift. You can usually adjust the size of models in your 3D printing software so you can adjust the scale of items to fit inside your cracker. Mr Alligator is one of our favourite small things to print, it's an alligator-shaped clip that can be used to close a snack bag. The Twirl Mini Moustache is just the kind of daft thing lots of kids would love to find in the Christmas cracker. Fish Fossilz are awesome bendy fish that print in one go, these are lots of fun and will appear to all ages. These Flexible, Reusable Cable Ties are great for anyone who loves their tech. You can wrap them around cables to keep everything tidy. Kids will love a Duo Tone Whistle - a 3D printed whistle that can play two different notes. Dice are handy for kids and board game fans. This dice set has dice with different numbers of sides to choose from. Mini puzzles are popular in Christmas crackers. You could print several of these interlocking puzzles in different colours and then mix them up. These stick men are quick to print and come in a range of quirky poses. These paste pusher animals are fun and useful for kids - they help kids to get all the toothpaste out of the tube. These gyroscopic key chains make a great 3D printing demo and fiddle toy. How about a pendant that can be put on a necklace? We love this beautiful Mayan Lotus Flower. We love these gyroscopic snowflake decorations. They print in one piece and the middle rotates.